Students, healthcare workers and entrepreneurs in rural Africa transport heavy loads long distances over rugged terrain to meet basic livelihood needs. Compared to walking, bicycles allow them to haul more goods over longer distances in less time – provided the bicycle is strong and durable. In Africa, the disconnect between suppliers and end-users has resulted in bicycles designed to be inexpensive rather than robust; most begin to fall apart within weeks because they are not suitable for rugged terrain and bulky loads. This has dire consequences for people without access to other modes of transportation. The Qhubeka Buffalo bicycle is a robust bicycle engineered specifically for African terrain and load requirements. It is designed by World Bicycle Relief in Chicago USA, tested and assembled in South Africa with close attention to end-user feedback and rigorous quality control. We are committed to providing the highest quality, most durable bicycles in Africa, and we operate with constant attention to innovation and product improvement to ensure that our bicycles meet their users’ needs. Our product management team oversees a fleet of riders who test current and potential components under the most punishing field conditions; their feedback is used to improve our bicycles. Furthermore, Buffalo Bicycles are compatible with locally available spare parts, ensuring that with proper maintenance they will last for years. 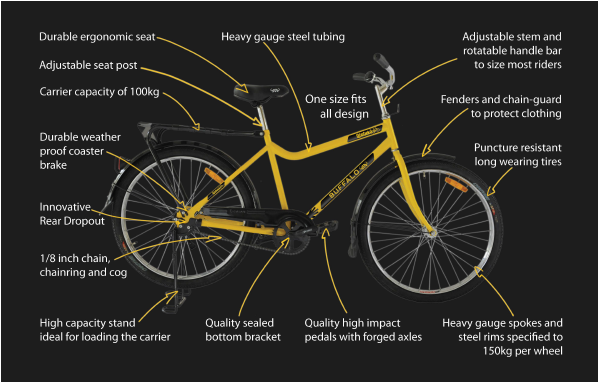 These design innovations make Qhubeka Buffalo Bicycles the best on the market: our bicycle is built for Africa! Qhubeka Buffalo Bicycles are sourced from manufacturers in Asia with some components made by fabricators in South Africa who produce each component to our specifications. Our bicycles are built from the highest quality parts. The bicycles arrive completely unassembled at Qhubeka facilities in South Africa where local teams put them together. Our assembly staff take great pride in their work and ensure that each bicycle is properly assembled. Even the most robust bicycle needs maintenance, particularly in the harsh conditions of Africa. Each Qhubeka Buffalo Bicycle comes with a helmet, a pump and a cable-lock and a small tool for basic maintenance. To ensure that bicycle owners have access to local, qualified repair service, Qhubeka has developed a Field Mechanics Training Program to accompany bicycle distribution. Mechanics are trained in bicycle assembly, maintenance and repair as well as basic business, marketing and management skills. Each trained mechanic receives a set of bicycle tools, and some mechanics establish businesses and purchase a stock of spare parts. Why Buffalo? Qhubeka Bicycles were designed by World Bicycle Relief and are built to be as tough as the fierce African buffalo, a symbol of strength and power; hence the brand name Buffalo Bicycle. All Buffalo Bicycles and spare parts are carefully branded to assure the end-users that they have purchased the genuine product rather than a low-quality imitation. In addition, Qhubeka offers the CSI investor the opportunity to individualise your Qhubeka Buffalo bicycles with your brand colours and logos for orders in multiples of 1,100 bicycles. The Schwab Foundation for Social Entrepreneurship and World Economic Forum have recognised our bicycle supplier, Buffalo Bicycle Company, with the 2013 Award for Social Entrepreneurship. The Entrepreneur of the Year award acknowledges innovative approaches and outstanding work in health, education, employment and the environment. As a wholly owned subsidiary of World Bicycle Relief, the Buffalo Bicycle Company manufactures the specially designed Buffalo Bicycles. Purpose-built for rugged terrain and heavy loads, these bikes help people better access education, healthcare and economic opportunity. In August 2014, BBC named the Buffalo Bicycle one of the 10 most beautiful bicycles in the world. Download the Qhubeka Buffalo Bicycle specifications document. Download the Qhubeka helmet technical specifications document. Download the Qhubeka bicycle safety poster. If you would like to buy a bicycle for yourself or someone you know you can find more information here.